1. UVXY is not a stock, it is an ETF (exchange-traded fund). 2. It has consistently lost money every year since its creation. UVXY’s full name is Ultra VIX Short-Term Futures ETF, and besides the fact that it can be bought and sold just like a stock, there’s actually not much that makes it similar to a stock at all. By knowing a few key points about this volatility ETF, like why it’s inherently flawed, who manages it, and how it trades, you can gain insight on how to capitalize on the opportunities it presents. UVXY aims to track 2x the performance the S&P 500 VIX Short-Term Futures Index, and this index measures the returns of a portfolio of monthly VIX futures contracts, namely the two nearest monthly contracts. ProShares, a large institution that creates and manages ETFs, runs UVXY and distinctly classifies it as a short-term trade due to its 2x leverage and exposure to volatility contango. Simply put, UVXY tracks twice the performance of the S&P 500 VIX Short-Term Futures Index and provides twice the leverage. In order to create a product that accurately replicates the performance S&P 500 VIX Short-Term Futures Index (which is not directly tradable itself, just like the VIX Index), the managers of UVXY need to hold a large amount of VIX futures contracts – and they certainly do. On any given day, just to maintain adequate exposure to track the S&P 500 VIX Short-Term Futures Index, the managers of UVXY hold around 65,000 VIX futures contracts with a notional value of almost $700,000,000. As a general rule, the further out in time you go, the more expensive it is to buy volatility, like VIX futures. In a period of time as narrow as five days from now, a market crash is somewhat unlikely. But on a time span of six months from now, the odds increase. This is one of the core principles of why VIX futures that are further out in time are generally more expensive, but not always. Look at this table showing the current prices of monthly VIX futures. The price of September futures are $12.775 and October futures are $13.515. In the case of UVXY, the ProShares managers are purchasing the September and October VIX futures contracts for a premium, and then ultimately selling them for a loss as expiration nears. If nothing happens in the markets, or even if something happens but the market recovers, the October VIX futures that were purchased for $13.515 would be worth around $12.775 after just 28 days. This is the cost of carry associated with VIX futures and this is the reason why UVXY closes in the red most months. 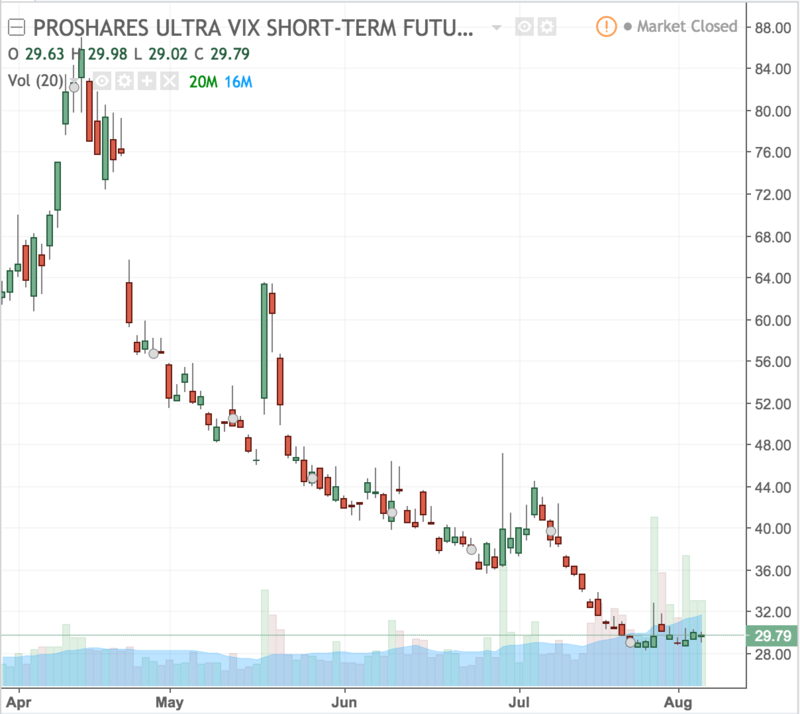 Since the fund managers of UVXY need to constantly purchase a basket of near-term VIX futures, ProShares is essentially buying high and selling low. Not a great recipe for investment success. Hence, the performance of UVXY is -91.30% since its inception. As you could guess, since UVXY was created on October 3, 2011, it has lost money every single year. This is why holding UVXY should never be done long-term! Look at the YTD return of UVXY vs the S&P 500 VIX Short-Term Futures Index (the index UVXY tracks). Due to the double leveraged nature of UVXY, it performs worse than the actual index it tracks! As if that weren’t enough, if you would have bought into UVXY when it first launched in 2011, you would have lost 91.31% of your investment. If you’re thinking about buying and holding UVXY, simply don’t do it. You are almost guaranteed to lose your money unless there is a prolonged financial crisis and volatility reverses its course. 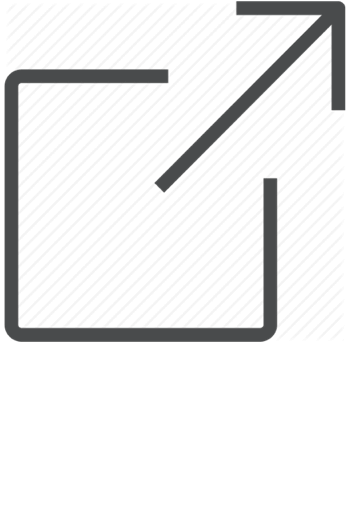 ProShares and third-party Authorized Participants (market makers) have computer algorithms that ensure UVXY’s market price is always very close to the value of the S&P 500 VIX Short-Term Futures Index. If it diverges too much at any time, because a retail investor is purchasing a large amount of shares and pushes up the price for example, Authorized Participants will step in a short the necessary amount of stock. Similarly, if too many people are dumping their UVXY shares and it causes the price to sink below the value of the index it tracks, the Authorized Participants will step in and buy shares. Almost all of the “market making” in UVXY is done algorithmically. Meaning, very few people are sitting in front of their computers all day long waiting for the price of one ETF to deviate too much so they can correct it. Managing a portfolio of 65,000+ VIX near-term futures contracts to maintain an average of 30 days until expiration is not done pro bono. If you buy UVXY, your entire position will automatically be subjected to an expense ratio of 0.95%. Expense ratios are standard practice in the world of ETFs, but there is something else ProShares does with their volatility ETFs that is not standard practice. From the above screenshot showing the daily holdings, note the large amount of cash, some $382 million, sitting on the sidelines. What does ProShares do with this uninvested cash? Simply put, they start collecting interest on the cash you give them after you buy UVXY. In ProShare’s investment prospectus, they state how a portion of any of the available funds can be used to purchase low risk, fixed-income investments like Treasury bills and money market funds/accounts. Even if ProShares uses a money market account that yields just 1% on cash, that’s an extra $4,000,000 they make off of the investors who buy into their fund every year. Pretty smart, for them. Will UVXY go to Zero? Although it’s not technically guaranteed, it’s highly likely. UVXY has gone to zero multiple times due to contango loss in VIX futures. Because financial assets can’t trade below zero, UVXY avoids trading below zero by reverse splitting at ratios as high as 5:1. Once UVXY gets close to, say, $5.00, the fund managers will reverse split it by creating 5 times the number of shares which brings the price back to $25.00. As the value of UVXY deteriorates, this splitting process repeats. Most UVXY charts don’t account for the numerous reverse splits, so long-term charts can be deceiving. Because UVXY is an ETF, it can be bought and sold just like a stock. Regular trading and after-hours trading is essentially the same. However, purchasing UVXY doesn’t give you a piece of a company like purchasing a stock does. Instead, you’re buying into a fund that that is dedicated to tracking the two nearest-term VIX futures. Traders look to purchase UVXY when they think there will be a sharp increase in volatility. Buying UVXY equates to, more or less, direct exposure to the two most active (near-term) VIX futures. As long as VIX futures are in contango and volatility doesn’t increase, UVXY will lose money every month. As such, timing is crucial when going long, but it can be very profitable when volatility explodes. UVXY can double in price in a matter of a few days, and that’s why traders are always looking for the right opportunity to go long. Not many other financial assets offer that kind of opportunity, especially ones that are purchasable in an IRA or regular brokerage account. Because it’s literally not recommended to hold UVXY long-term by its creators, and since it has lost money every year since inception, many traders look to sell UVXY short, but this has its own set of risks. This has become a very popular trade in recent years, but traders looking to short volatility ETFs need to be aware of the possibility of a very sharp and fast increase in price. An overnight market crash or other panic-driven event would likely wipe out a 2x leveraged short volatility position. Nevertheless, a lot of traders accept the very low probability of a huge increase in volatility with a big loss for a very high probability of value deterioration for a small gain. Since UVXY is leveraged 2x, the contango effect is magnified and short sellers capitalize on this. Because of the popularity in shorting UVXY, it is sometimes hard to find shares to borrow. It is a little-known secret in the trading world that MB Trading and Cobra Trading have the best borrow available for short sellers. MB Trading has been acquired and is now a part of Ally Invest. Cobra Trading is an introducing broker for Interactive Brokers, so this means Interactive Brokers usually has pretty good borrow available. The primary reason to trade UVXY is to gain exposure to volatility as an asset class. Remember, since there is no way to directly buy the VIX Index, traders resort to buying and selling ETFs like UVXY to speculate and hedge with volatility. Because futures trading requires additional broker approval, trading UVXY is a common approach in lieu of trading VIX futures. Because it’s leveraged 2x, and because the S&P 500 VIX Short-Term Futures Index can trade up by 20% on a volatile day, UVXY is appealing when volatility soars. It’s not uncommon to see UVXY increase by 30%+ in as short of time frame as an hour. You buy UVXY, volatility increases, and UVXY yields a 20%-100% ROI. You buy UVXY, it deteriorates from contango and 2x leverage, and you gradually lose money. You short UVXY, volatility increases, and you are suddenly out 20%-100% on your short position. When positions are sized properly, trading UVXY on either the long or the short side can be very effective. As it stands, it’s often best to avoid UVXY unless you are comfortable with the augmented exposure it provides. If you are comfortable with the explosive nature of UVXY, and want to trade it, you’ll need to enter and exit positions very quickly. To do this and have the best chance of succeeding, you need to keep your fees and commissions extremely low. Ally Invest has the some of the cheapest commissions in the industry and is a popular choice among those looking to trade or arbitrage UVXY. Trade UVXY commission-free. Start investing at Ally Invest and get a $200 cash bonus or $500 in commission-free trades!